Hoshi no Samidare by Mizukami Satoshi, known in English bizarrely as Lucifer and the Biscuit Hammer (and sometimes The Lucifer and Biscuit Hammer) is an odd manga. Ostensibly a story about a boy who gets mystic powers in order to fight an evil golem-creating wizard, The Lucifer and Biscuit Hammer sports an eccentric cast of characters, an even stranger goal for its main characters, and a convoluted sense of narrative progression that somehow only adds to its appeal. Amamiya Yuuhi, who has all the appearance of a typical high school kid, wakes up one day to find a talking lizard. The lizard, Neu, informs Yuuhi hat he is a knight who must protect their princess from an evil wizard and save the world from the dreaded Earth-shattering “Biscuit Hammer,” a huge mallet hanging over the planet visible only to those with profound despair. However, the princess, Asahina Samidare, is fiercely powerful, possessing beyond superhuman strength, and has her own agenda. Calling herself a demon lord (the titular “Lucifer”), Samidare seeks to stop the Biscuit Hammer because she in fact wishes to destroy the planet herself, and Yuuhi becomes her loyal servant in her cause. Overall, the series can be viewed as a kind of sekai-kei (world-style) manga, stories where the fate of the world rests on a “you and me” relationship. 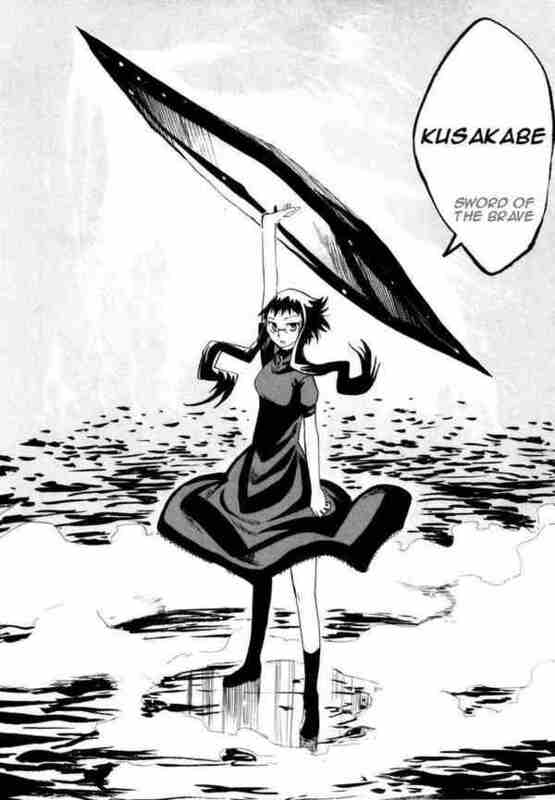 When I say that this manga’s sense of progression can be confusing, what I mean is that often times it seems as if the stakes of their battle seem both all-important and frivolous at the same time. Most of the characters have unusual personalities that position them somewhere between delusional and disillusioned, trapped by their own immaturity, but many of them grow over the course of the series. Their fight to foil the wizard and his Biscuit Hammer involves taking on progressively stronger and stronger golems as if they were video game bosses, but then sometimes a friend or ally will die in battle. The emotional weight of the deaths are expressed as quite significant and serious, and yet the question of whether they’ve made any real progress (or how progress can be defined) is ambiguous. It might sound frustrating, but it gives Lucifer and the Biscuit Hammer an odd charm. If anything, it feels akin to a more optimistic and lighthearted Bokurano. While that series is about as fun and happy as a mass suicide, there’s a similar sense of characters grasping at the darkness. The art in Lucifer and the Biscuit Hammer has an unrefined quality to it, where characters appear a bit flat and the world feels frayed and uneasy. However, I believe that this also helps to give the manga that shaky sense of progression that makes it such an interesting story. The manga also does a good job of playing with and presenting its characters’ powers, especially given the versatility of their core ability. Each character is capable of using a “holding field,” a mass of dense energy that can be used in a variety of ways, including creating stepping stones in the air, being thrown as a spear, and more. It can be a difficult thing to make look interesting, yet the action scenes have weight and impact. Overall, I find that Lucifer and the Biscuit Hammer is not so much an addictive series that has you hungering for the next chapter, but is rather one that invites you to slowly observe its seemingly by-the-numbers premise of fighting and power ups. From there, it draws you in by portraying each character’s struggle and a unique sense of stasis that seems to permeate its world and its story, making its introspective qualities feel that much more as if they’re coming from a place that ignores time and space. This entry was posted in manga, review and tagged hoshi no samidare, lucifer and the biscuit hammer, the lucifer and biscuit hammer. Bookmark the permalink. a huge mallet hanging over the planet visible only to those with profound despair. I thought it was only visible to people who knew about it, or was that a mistranslation? I think I remember Yuuhi being able to see it after having it pointed out to him. I actually DID find it pretty addictive up until about the two-thirds point, where it just seemed to go off the rails, becoming sort of unsure as to exactly how it wanted to portray its Big Bad and therefore, in what manner it wanted to end (and what sort of “moral” it wanted to put forward). And the very end, with its “here’s where everyone wound up many years later” was particularly bad, at least in my opinion, foreclosing any reader imagination with a very humdrum “and everyone lived happily ever after” conclusion. I’d definitely still recommend it, but more as something that’s very good, rather than truly great, which I think it could have been with a better thought-out final third. One of my favorites, ever. Have you read Mizukami’s current series SPIRIT CIRCLE? It’s on Crunchyroll and definitely worth checking out.